The Auditor of State's Office offers comprehensive quality assistance to government entities throughout Ohio. The objective of LGS is to serve as a consulting and fiscal advisory group to all government agencies, school systems and political subdivisions. We provide assistance in preparing Annual Financial Reports. Our assistance is wide ranging - On one end of the spectrum, we provide a complete set of detailed workpapers along with the report. On the other end, we will supervise and train you and your staff. We assist in preparing GAAP reports (Comprehensive Annual Financial Reports (CAFR) or Basic Statements) or cash basis reports (cash or modified cash Other Comprehensive Basic of Accounting (OCBOA)). Experiencing financial issues or just needing a refresher course in proper financial planning for your government? WE CAN HELP! We assist in preparing or providing training to you and your staff in the preparation of long-term planning documents which include, but are not limited to, a five-year forecast and a capital maintenance plan. We can demonstrate how to integrate your long-term planning process into your yearly budgetary cycle. If your records are a mess ... CALL LGS! Are you a new fiscal officer/legislator or have you inherited financial and budgetary records that need improvement? WE CAN HELP! When fund balances have not been reconciled to depositories on a monthly basis or accounting journals and ledgers are incomplete or inaccurate or there are no financial records, LGS’ experienced staff can not only perform reconciliations, proofs of cash, and reconstructions, we can also train your team on proper procedures. We provide training to fiscal officers/ administrators/ legislators on proper accounting, budgetary and reporting for local governments. Want to update your internal operations? Want to provide uniform guidance to employees in performing their duties? WE CAN HELP! We can provide guidance in the development of policies and procedures along with establishing strong internal controls. LGS staff will provide assistance to municipalities/ townships within the procedures of dissolving or merging under the guidelines of Ohio Revised Code Chapters 523, 703, and 709. We will facilitate the timely transfer of property and services. Mergers: RC §§ 523.01 – 523.07 - Township Mergers (with other townships) The territory of one or more townships may be merged with that of a contiguous township to create a new township, in the manner provided under this chapter. The new township shall have all of, and only, the rights, powers, and responsibilities afforded by law to townships. RC §§ 709.43 – 709.48 – Municipal and Township Mergers (with other municipalities or townships) ”Merger” means the annexation, one to another, of existing municipal corporations or of the unincorporated area of a township with one or more municipal corporations, or the merger of one or more municipal corporations with the unincorporated area of a township. Web GAAP is internet-based software patterned after LGS’s spreadsheet approach to GAAP conversions. Designed to assist local governments in the conversions of year-end cash basis information into a financial report that conforms to GAAP. The software was developed to accommodate schools, counties and cities. LGS provides accounting support to UAN clients to ensure proper accounting transactions within the system. Assist all types of local governments. LGS has over 30-years of experiences working with local governments in fiscal emergency, fiscal watch or fiscal caution. Assist or train you and your staff in the preparation of a financial recovery plan which will include long-term planning documents such as a five-year forecast and a capital maintenance plan. Review your accounting, budgetary, and reporting processes and if necessary make constructive comments. LGS provides educational opportunities to keep Ohio’s local government officials up to date on Ohio laws and fiscal regulations. 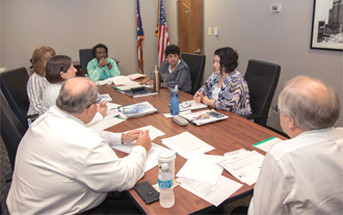 Examples of trainings offered are the Local Government Officials Conference (LGOC) and the mandatory Village Fiscal Officers trainings conducted through regional sessions throughout Ohio. We are recognized nationally and state wide for our leadership role in preparing annual financial reports, particularly those on a GAAP basis. Since the mid 1980s we have assisted local governments with their financial, accounting and budgetary concerns. Since the creation of LGS, our sole mission is to provide experienced, professional services to local governments. Our staff includes supervisors who have hundreds of years of combined experience in helping local governments. to receive assistance for your local government.